It’s squash season! Spaghetti squash. It’s the bright yellow color. 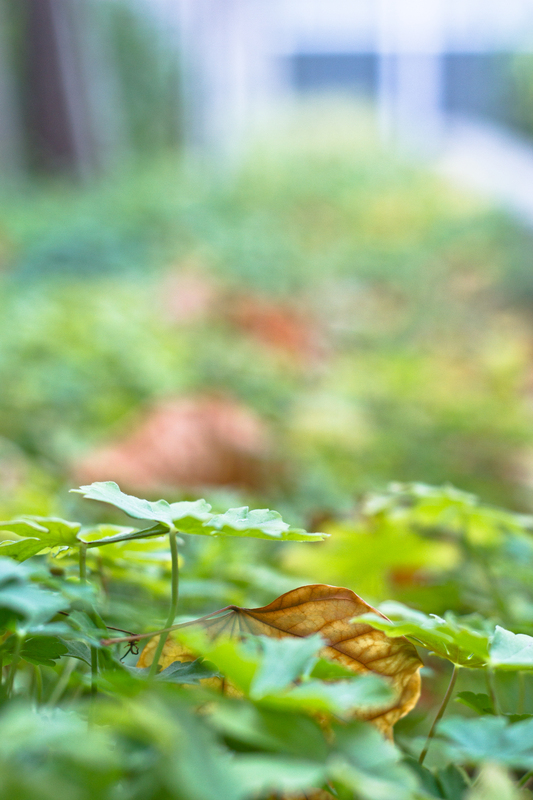 It’s the smell of freshness. It’s the feel of texture. Badly tempted me to bring one of these babies home. So I did. It is known for its strands that look just exactly like angel hair pasta. Or even Chinese egg noodles. They do! Low carb dieters, you are in luck. 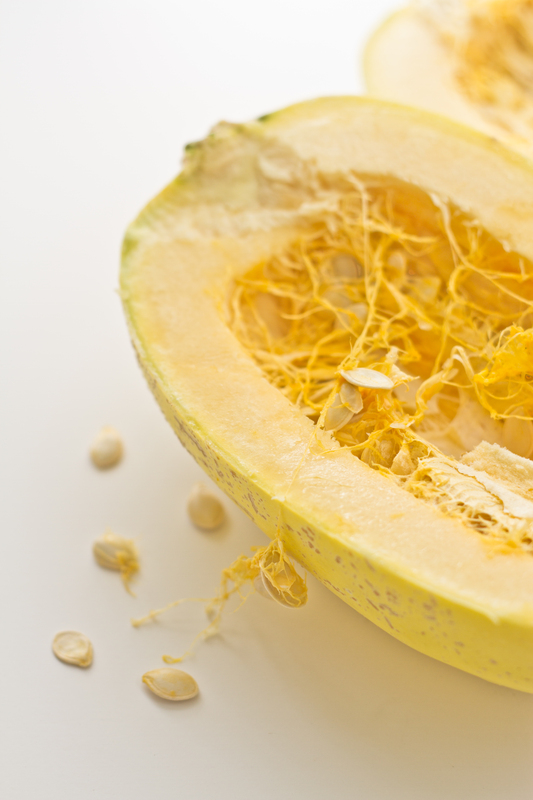 You can eat the entire squash and not have to worry about calories. This is the first time I have tried spaghetti squash as well as cooking with it. Season with herbs was playing it safe but the most righteous thing to do. I have to say this is a keepsake recipe for sure. Now onto candies for dessert! Preheat oven to 375F. Place cut side up in a baking sheet. Brush the sides and middles with 1 tablespoon of olive oil. Roast till tender, about 45 minutes. Let cool. Scrape squash with a fork to remove flesh in long strands. Place in a large bowl. Set aside. Meanwhile, season shrimp with salt and pepper. Coat with 1 teaspoon oil. Let it marinate for at least 10 minutes. Heat a frying pan on medium heat. Cook shrimps until tender. Set aside. Melt the butter in the frying pan on medium heat. Toss in garlic and onion to cook until golden brown or tender, about 5- 7 minutes. Add rosemary and thyme. Combine and stir, about 3 minutes, or till herb gives off its aroma. Add spaghetti squash, lemon juice, salt, and pepper. Stir and combine, for about 3 minutes. Add shrimp and any cooking juices. Toss and combine. Remove from heat immediately. 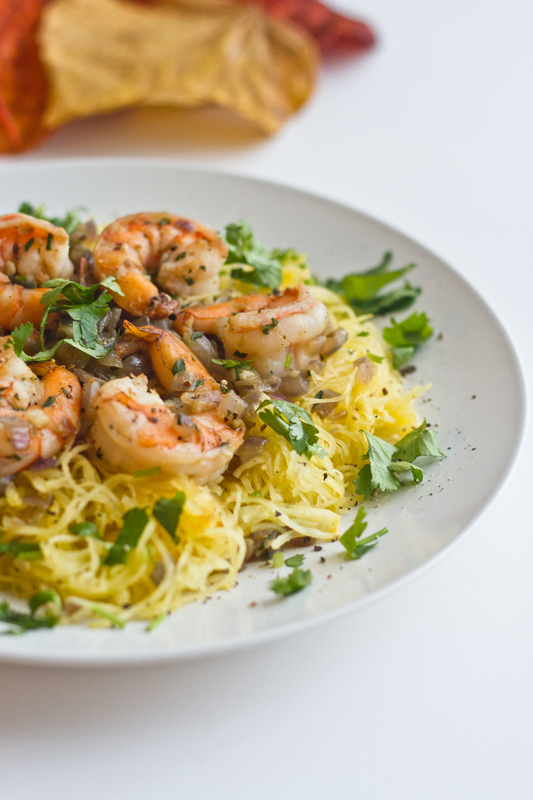 Garnish with cilantro and serve with lemon wedges. 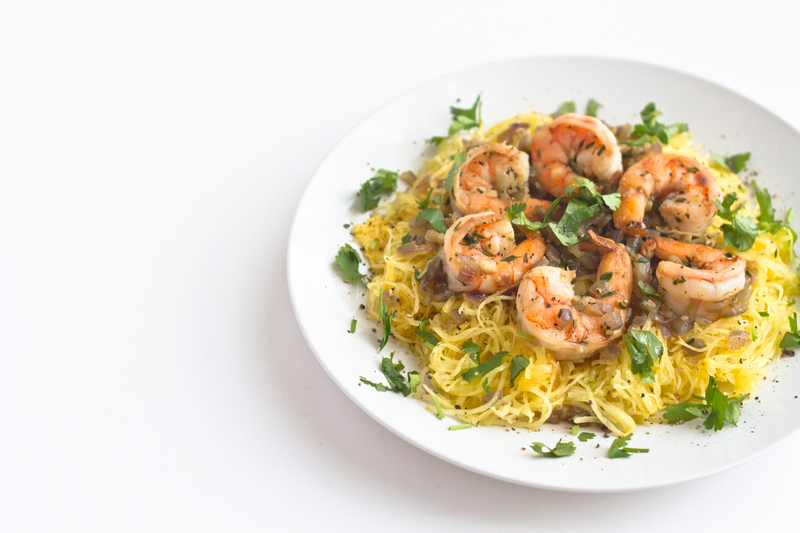 This entry was posted in Food & Drink, Quick Meal, Salad, Seafood, Vegetarian and tagged angel hair pasta, chinese egg noodles, dinner, Food & Drink, food photography, herbs, low carb dieters, roasted spaghetti squash, shrimp pasta, vegetarian. Bookmark the permalink. Looks so yum!! 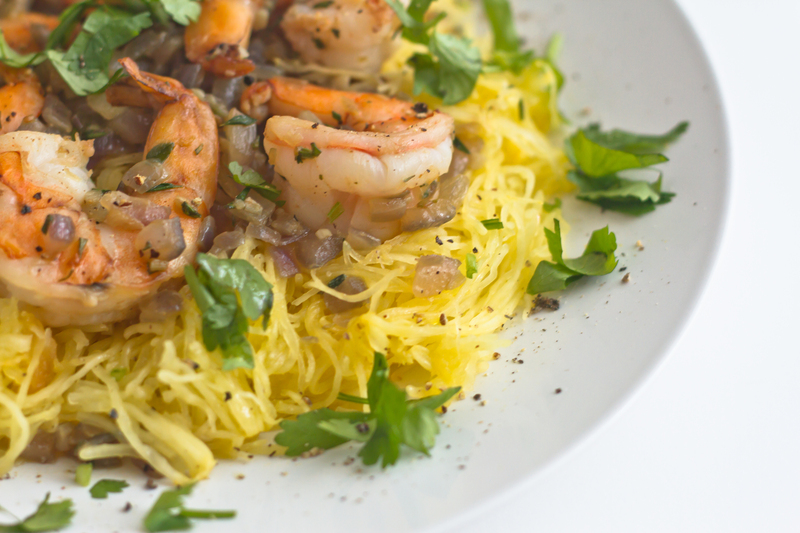 Good combination – squash n shrimp! lunch time! and happy halloween to you!!! you are very welcome! hope you will enjoy the recipe as much as i did. Hello! it really does look like chinese wanton noodles! How exactly did u make the spaghetti squash? did you have to peel them out strand by strand? I think you’ve convinced me to try this squash again. Did you find it a bit watery? Was it flavorful enough? Yum, quick and easy to prepare. Time to follow you. Hi there! I wanted to try this again – Is it ok to roast sliced side up?? Ahhh Sliced side down I mean! Hello, I’m so glad I Found this recipe as my cold storage area has just hit the freezing temps and I need to use up my spaghetti squash. Perfectly timed and I thank you. Happy New Year, Anne Marie! 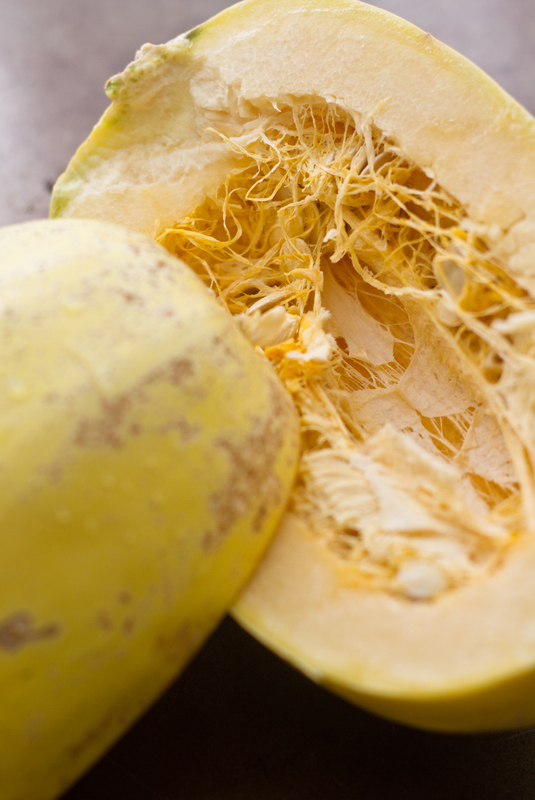 A spaghetti squash could take up quite a bit of fridge space. Hope you will like the recipe as much as I do. Let me know how it goes.